For a long time we've had the dream of building an artist community with facilities to support theater, dance, music and the visual arts, in particular the 'fire arts': Blacksmithing, Ceramics, and Glassblowing for example. The search for such a place in the Boston area proved frustrating and expensive and the idea was shelved. 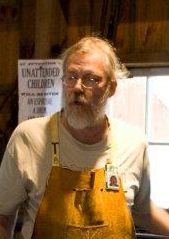 In the Spring of '06 Mike approached Metalwerx and asked about doing a blacksmithing demonstration or class in their facility. They politely declined the opportunity on account of their percieved ludicrousness of such an idea, but suggested that the light industrial space that was for lease right next door might be an ideal location for such an activity. We officially opened Prospect Hill Forge on May 1, 2007 (after about a year of learning to deal with state and local bureaucracy and regulation). 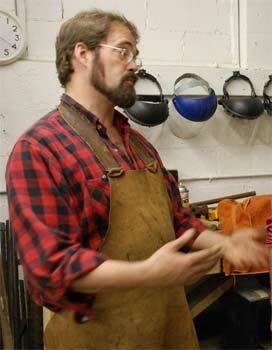 Our goal was to create a place where people could learn and practice blacksmithing. We have four 'work stations'; each has a coal forge, a bench, a blacksmith's vise, a machinist's vise, a collection of hammers, punches, chisels, measuring tools... just about everything that's needed. Each forge is a little different in construction. Some have electric blowers, some have hand-powered blowers, some are 'official' old-style made-for-the-purpose forges, others were hand-made right here in the smithy. We feel that it's important that our students understand that there is no one way to pursue this craft and there is no one perfect set of tools that will handle all jobs. A forge can be anything from a couple of holes in the ground and a shingle to a carefully fitted induction coil, or anything in between. Carl began blacksmithing in '77 after reading Aldren A. Watson's "The Village Blacksmith" and has been doing it off and on since. "Whenever my landlord has allowed it, I've had a forge set up." He earned a BFA in Sculpture at Carnegie-Mellon University in Pittsburgh. While there he studied calligraphy under Arnold Bank, whose influence he carries in both his work and his teaching. During those college summers he smithed with Warren Swanson at Rockhaven Handcrafts in West Newfield, Maine. "I learned a lot with Warren: how to run a fire, how the metal moves under the hammer, how to make a hundred fireplace pokers in a day..." He also did a stint at Groll Ironwork on the Southside of Pittsburgh, and learned a bit about perfectionism. Between then and starting Prospect Hill Forge he was an armorer for himself and other medieval recreationists, a type designer, a graphic artist, a programmer, and a watch and jewelry repairman. Carl has competed in the Fitchburg Forge-In six times and is the proud owner of four Professional Division Champion's jackets, and a couple of second-place ribbons. Mr. Bergman has been working with metal since he started casting lead soldiers as a child. Since then his interests have spread from casting in various metals to blacksmithing, to machine tools, and to woodworking. Using mostly traditional techniques and tools, he builds medieval furniture, and restores 19th century furniture. "Sometimes it's surprising just how efficiently traditional techniques work with traditional tools. Often better than attempting the same techniques with modern tools." Mr. Bergman's interests come together in the need to design and construct his own woodworking tools, hence his interest in blacksmithing.